Because you share more than a postal code. Find: A lost pet, your missing keys, parking space to rent, a trusted babysitter, an expert tutor or the local dog wisperer. Share: A ride, important news, favourite recipes, your expertise, your neighbourhood pride. 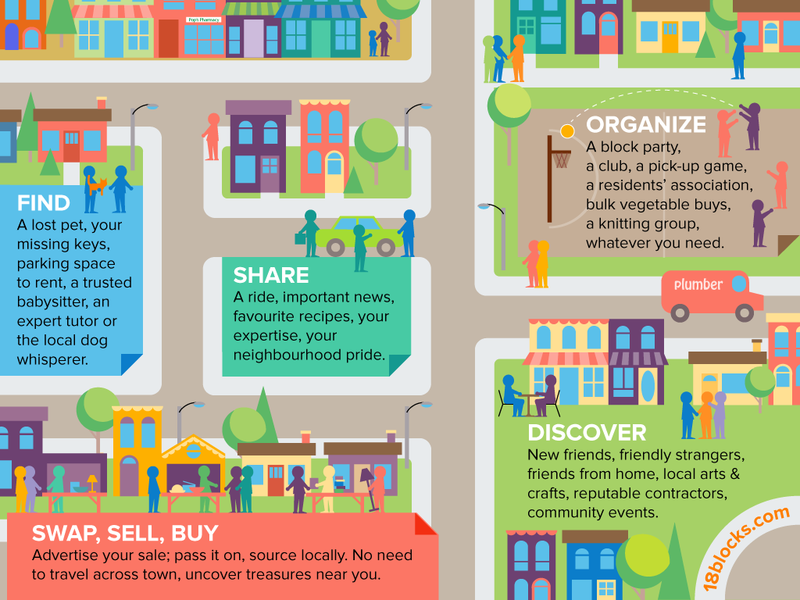 Organize: A block party, a club, a pick-up game, a residents' association, bulk vegetable buys, a knitting group, whatever you need. Swap, Sell, Buy: Advertise your sale; pass it on, source locally,. No need to travel across town, uncover treasures near you. Discover: New friends, friendly strangers, friends from home, local arts & crafts, reputable contractors, community events. 18Blocks is your neighbourhood notice board. If this isn't your neighbourhood, click here. Please register to post Notes, comment, use our confidential messaging service or receive email alerts for comments and replies to your posts. If you are seeing this message, your browser is having a problem loading the site. Try to clear the cache and refresh the page or try another browser. This page is out of date. Please reload the page for best results. You can also click on this banner to reload.